So more or less, all over the world people are making similar resolutions. Overall I am not a big fan of resolutions and after reading this I realized I need to think differently. So this year, it’s a year of promises for me. 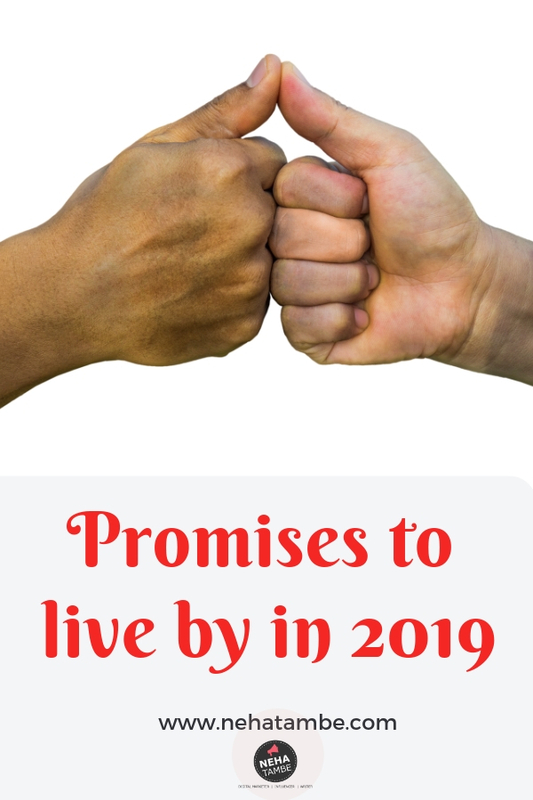 I am making promises to me and I wish to fulfill them by end of 2019. The gadgets and other priorities are enough to distract us. Our precious kids really wish to share something with us and remind us of our childhood, if only we stop and listen. This year I promise to keep a few hours distraction free. I plan to relive my childhood through their talks and dreams. I see a mini-me in them and that’s what I plan to experience and cherish this year. I love reading thrillers. There was a time when a good thriller was done in one sitting but now my shelf is strewn with half read books. I have also realized that it was because I did something I loved, I stayed active and sharp. I promise to get back to reading and with my new find of audio books. I plan to enjoy regional books as well. There were many things I loved doing, but now for want of time or other priorities all those things have been on a back-burner for a long time. This year I promise to do atleast one thing just because I love to do it. No logic, no worry if I am wasting my time, no thoughts about what I or others will gain from it. I will do it; simply for the pure joy it gives my heart. My mindset is usually of someone who is following her checklist. I need to do something that makes me overcome my inhibitions, push boundaries and just follow my passion. That’s the kind of mindset I want to bring in me. I want to challenge myself. Health scares, sudden loss and things like that made me realize nothing is permanent. You might have the world at your feet but everything will be immaterial the next minute, if you aren’t there to enjoy it. Live and appreciate every moment. The world is filled with wonders and we need to seize the moment and appreciate it. A brilliantly lit-up sky, a flowering bud, tiny birds and unbridled laughter – there’s beauty in everything. In the times of fake news, fake body, fake emotions, fake videos and fake praises it is tough to keep your sanity and continue to look at something objectively. I wish to stay away from everything fake and help my kids develop the skill as well. There is a need for a questioning mind and a scientific temperament for looking at things. It’s only with this that we can avoid being entrapped into a vicious circle of self-doubt, depression and self-loathing. These are my New Year promises to myself for me and my kids. What are your New Year resolutions for 2019? Wow Neha, your decision to make promises rather than resolution is amazing, where most of our thoughts are inline, even i need to get back to reading and learning something new . hope you get to keep your promises, all the best wishes. Oh yes, resolutions make no sense. This year, I have set up a few goals for myself that I intend to develop into habits. Simple, doable goals, really that won’t leave me feeling frustrated if I am unable to fulfil them and will eventually turn into habits for a life time. WIsh you the best for 2019! 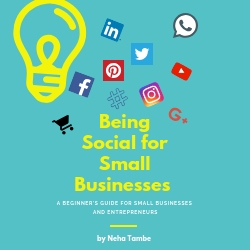 Lovely post Neha! It is true that promises make things more closer to the heart and more like a rule to follow types than resolutions. I too wish to minimize my screen time this year. I have a toddler and wish I spend more time doing the silly things than worrying about what others will think about me, It is so much like reliving childhood, especially the moments that I don’t remember much! I wish to travel more this year, get lost in books, play a lot with baby girl, cook healthy meals and write a lot! Happy 2019! Great post, Neha. Even I don’t believe in making and breaking resolutions and I prefer calling them as a promise to myself. The points you have listed are all so realistic and doable, unlike the typical ones we make just to break them after a week or so. Thanks for being a part of our blog train. I am so done with resolutions and have started making intentions. Earlier I aimed for reading 100 books a year and recently am no where that number, so i started to have intention of reading whenever I can. Like you Neha. I enjoy this way a lot. I feel your goals this year are doable and practical .Wish you luck dear. I love the idea of learning something new and reading. I really want to read and learn more. As nowadays we spent more time on youtube and Instagram. Neha, I liked you short and sweet list. It covers almost all the important ares. I am not very fond of resolutions . I rather call them a chance to improve myself. Hopefully , I would be able to to keep up with my list. A tweak of one’s mindset and avoiding fake stuff that floats around both in the offline and online world are praiseworthy resolutions to have, besides others. Lovely! Lovely post , I liked your views , in this fake world too difficult to get real emotions and feelings . Traveling and seeing the world is something in my list too. Lovely promises Neha, I agree on being mindful, more me time and changing ourselves to good. Really appreciate your list of promises, Neha. I think I am going to emulate them. Also, I have no doubts that will diligently follow through with these. All the best. 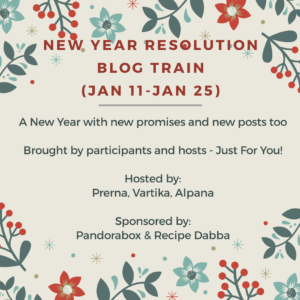 Lovely post-Neha, and I loved all the promises you have made this year. indeed, living in the moment and enjoy life to its fullest should be our priority. all the best and may you get all the happiness and success in the upcoming year! “Year of promises” is far more promising than year of resolutions. I liked this thought Neha. Going through various promises, I realised that all that one needs is a mindful living. Some simple promises to keep to self and the life is all set, ready to take on the challenges and relish the moments of glory and peace equally. Wishing you a great year ahead. May all your promises are fulfilled. I just love the concept of promises rather than resolutions!! I can relate to changing mindset. No checklist, no planning – just wanted to follow my passion!! This is such a unique approach. Making promises instead of resolutions. My reading needs to pick up really fast. I am leaving with some inspiration from your post. Awesome read.. I would also like to make these promises for the upcoming year. Specially I want to learn to live in the present moment.. I am getting so much inspiration from your post Neha. For the very first point, I am struggling hard to make this understand to my husband. Checking update on phone while talking to someone seems very disconnected to me and I dont like when he does the same. Humans need attention and eye contact while communicating. That makes us living being not robots!! Your promises seem to hold a lot of value in your life. That’s a serious take on resolutions must say. I like your idea of making promises instead of resolutions. You have come up with a list that most of us can relate to. Good luck to you! This is a simple yet fulfilling 2019 resolutions for sure. I will try to follow this one for sure whenever I have a writer’s block 🙂 It kinda adds positive vibes to me. Simple promises which can be kept and I liked all of them and you have articulated them well, Neha. Good luck with them. ‘Promise’ sure does sound better and less-daunting than ‘Resolution’. All the best with all your promises, specially the last one, as it is the biggest menace of our times. Yes…I loves the idea of promises over the resolutions. I wish you all the best. Especially, the reading point took a dig at me. How I wish to read …diligently. Making promises and not resolutions is a great way to stay true to yourself. aah, I so wana promise myself to make some me-time. But, sigh. I hardly get time to work, me-time is like not even in the list. I hope you get to carry out all these promises.